Gold is nearing $1,300 level and could soon fall below that psychological support if the American Dollar continues to gain altitude. The 1.7 percent drop from the recent high of $1,326 is likely associated with the greenback's five-day winning streak. 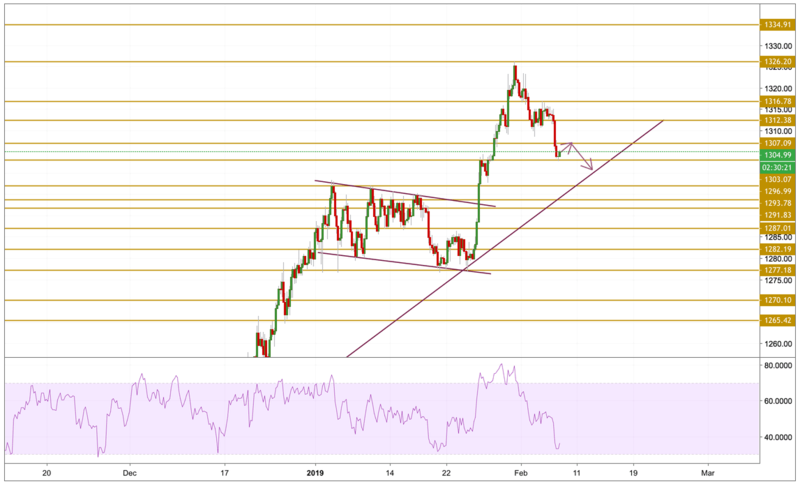 The positive momentum in DXY has been propped up by auspicious results from US fundamentals, particularly following the FOMC meeting, keeping the pressure on the yellow metal. Gold prices continue to move lower after breaking the $1312.38 level and head towards the $1303.07 support level. The price is currently hovering just below the $1305 level with a negative momentum as we can see on the RSI. The price has more room to drop before entering into an oversold state so we will be focusing mainly on the $1300 psychological and key support level.